Gov. Dannel P. Malloy says he will propose lowering Connecticut’s sales tax rate this week, while eliminating a partial exemption on clothing to produce a net tax revenue increase of $68 million in the next fiscal year. The move allows Malloy to rescind a major tax cut he signed last spring and touted during his re-election campaign last fall. The governor, who must tell lawmakers on Wednesday how he will close huge deficits in each of the next two fiscal years, hinted that he might defer or cancel a planned sales tax break on clothing. Business tax exemptions also are likely to be scaled back, he said. Mark Bergman, his spokesman, released limited revenue numbers after the broadcast and confirmed that the primary change would be the elimination of a partial sales tax exemption on clothing. “I think it’s a way to give some relief to the middle class as the economy keeps improving,” Malloy said of his sales tax initiative. The governor said Connecticut’s current rate of 6.35 percent would drop to 6.20 percent in November, and then to 5.95 percent in the 2016-17 fiscal year. The latter rate would be Connecticut’s lowest sales tax levy since 1971, Malloy said. Bergman said the governor’s proposed changes would yield a net sales tax revenue increase of $68 million in the fiscal year beginning July 1 and a net sales tax revenue loss of $12 million in the following year. State government now faces built-in deficits of $1.3 billion next year and $1.4 billion in 2016-17. 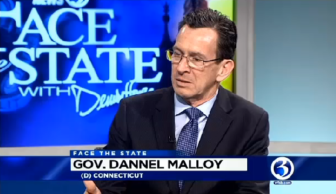 During the broadcast, Malloy made it clear that his plan would offset the revenue loss by getting rid of other tax breaks. “We will do away with some exemptions,” the governor said. Malloy tried to argue that a lower sales tax rate applied to more products would offer greater savings for some. But the numbers don’t appear to back the governor’s argument, even as it applied to middle-income families, at least for next year. Shaving one-seventh of 1 percentage point off the sales tax – and delaying that cut until November – would cost the state between $60 million and $70 million next fiscal year. Exempting clothing costing less than $50 from sales taxes – a tax break scheduled to start this July under legislation Malloy signed last May – would save consumers $145 million next year. The governor’s office declined to provide further details about the plan Sunday, indicating Malloy would be available to answer questions on Monday. Dropping the sales tax rate to 5.95 percent in the 2016-17 fiscal year would cost the state about $280 million, based on the latest revenue estimates. Connecticut has more than $7.1 billion worth of exemptions and credits on the books spread across all of its taxes combined, including almost $3.9 billion in the sales tax alone and another $360 million in its corporation tax.